Quit Doc Research and Educational Foundation and Tobacco Free Florida encouraged local residents to learn the facts about the harmful effects of using smokeless tobacco and to make a plan to stop using these products. To help raise awareness, Quit Doc Research and Educational Foundation observed Through With Chew Week from February 16-22. 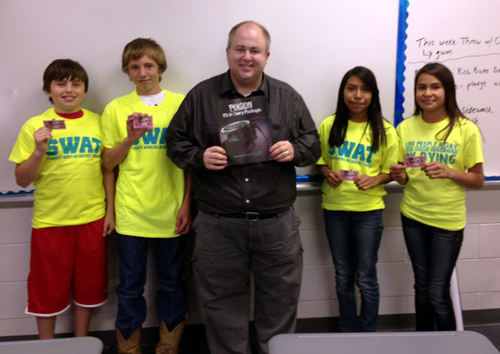 Osceola Middle School SWAT students also observed Through With Chew Week by handing out cards to students that has the 3 Ways to Quit Information along with a picture of the damage that smokeless tobacco can have on your smile. Compared to the decrease in youth cigarette use, there has not been a significant change in the use of smokeless tobacco products among youth in the state. In 2013, 5 percent of Florida high school students reported current use of smokeless tobacco products compared to 5.1 percent a decade ago (Florida Youth Tobacco Survey). However, rates of youth smokeless tobacco use are significantly higher in Okeechobee County. During the 2012 Florida Youth Tobacco Survey, in which county-specific data was collected, the rate of smokeless tobacco use among 8.5% of Okeechobee County high school Students reported current use of smokeless tobacco products. More alarming was that 6.6% of Okeechobee middle school students reported current use of smokeless tobacco, nearly three times higher than the state average of 2.3%. Smokeless tobacco includes products such as chew, spit, dip, snuff and snus. These products are commonly used by placing the product between the teeth and gum. The chemicals in smokeless tobacco are then absorbed into the bloodstream through the skin. “Constant exposure to tobacco juices in these smokeless products can cause oral cancers, which can form within just five years of regular use,” said Dr. Barry Hummel, Co-Founder of the Quit Doc Research and Education Foundation. “Meanwhile, the tobacco industry is attempting to entice young people with new smokeless products and appealing flavors, heavily marketing these products as safer to unsuspecting children and teenagers,” added Dr. Hummel. Users of smokeless tobacco have an 80 percent higher risk of oral cancer and a 60 percent higher risk of esophageal cancer and of pancreatic cancer compared to non-users. The use of smokeless tobacco also causes gum disease (gingivitis), which can lead to bone and tooth loss. Studies show adolescent boys who use smokeless tobacco have a higher risk of becoming cigarette smokers. Like cigarettes, smokeless tobacco products contain nicotine, a highly addictive and dangerous chemical. Adolescents’ bodies are more sensitive to nicotine, and adolescents are more easily addicted than adults. Furthermore, most tobacco users start by the age of 18. These young people rarely consider the long-term health consequences associated with tobacco use when they start and many continue using tobacco well into adulthood, often with serious and even deadly consequences. Quit Doc Research and Educational Foundation works to educate and inform citizens that smokeless tobacco products are not effective ways to quit smoking, Currently, there is no scientific or medical evidence that can prove the use of smokeless tobacco is an effective way for a person to quit smoking. For more information on the SWAT Program or the Tobacco Free Partnership, you can contact Courtney Moyett, the Tobacco Prevention Specialist in Okeechobee County, by calling 863-801-9140, or by email at cmoyett@quitdoc.com.